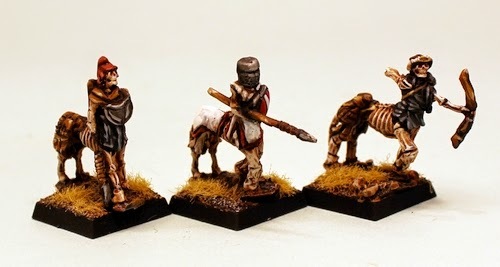 15mm.co.uk: HOT 15mm Skeleton Centaurs and Guard released! 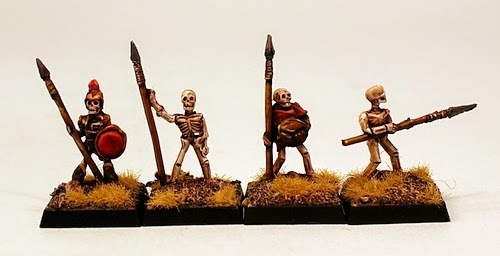 HOT 15mm Skeleton Centaurs and Guard released! We have moved the release of the second set of two codes of Undead into the HOT 15mm Fantasy range forward by a few days to today! Huzzah! Clamour is listened to and wargamers have been asking for us to do this, so we did. We have two new packs released today and these bring armoured skeleton infantry as well as something rather more unique 'Skeltaurs' skeletal centaur cavalry. Read on for the details. While I might be incorrect I think that these miniatures may well be unique and I have certainly never seen skeletal centaurs or 'skeltaurs' before in my meanderings. This pack gives some mixed use Undead cavalry with a twist. The first post is a skeltaur with spear and small shield wearing a felt up a sort of medium cavalry. The second pose is a skeltaur knight in armour and helmet armed with spear and shield for heavier cavalry and the last pose is a skeltaur with a bow for missile cavalry. The pack is a random mix of the three poses for a total of six miniatures they suit most settings from classic fantasy to dungeoneering and medieval fantasy crossovers too. As with the rest of the HOT range you have the choice of purchasing one pack or three packs saving 10% or a sampler containing one of each pose in the pack which is great for skirmishing. 4.00GBP per pack. Go HERE. As your ranks of rattling bone boys advance to meet their mortal foes you sometimes think that it would be nice if they upped the ante a bit with a touch of extra armour to deflect incoming swords, spears, halberds and those pesky fire arrows too. The upcoming Eternal Guard do that job nicely. Four different poses of Skeleton all in a mix of plate and mail armour. The first pose with sword and round shield, the second an axe and round shield, the third a large two handed sword and the forth with a sabre raised and a large round shield. Poses will be randomly mixed in the pack and these go great with HOT Skeleton archers and spears. As with the rest of the HOT range you have the choice of purchasing one pack or three packs saving 10% or a sampler containing one of each pose in the pack which is great for skirmishing. 4.00GBP per pack. Go HERE. Suitable for any 15mm Fantasy wargame rules system from HOTT 2nd Edition to Age of Might and Steel and others such as Song of Blades and Heroes. There are many other Undead army codes in the HOT range and you can see them all HERE. If you have ideas for HOT then I always want to hear them. The range almost always expands on the back of wargamers requests so comment here or all the better email me direct and let me know what you would like to see. There are mumblings of more monsters in the ether ports just now.